Sometimes trouble comes with fangs. Ranae Glass is the pen name for a popular YA author. She uses this name for her NA and adult novels. A smart but flawed heroine with a relatively typical disfunctional family and an undead ex fiance. It is a great and different premise and it worked. Thefe is a hint of romance with just enough emotional pulls that add to the story. I fel the bad guy was predictable but it didnt detract. Will read more by this author. 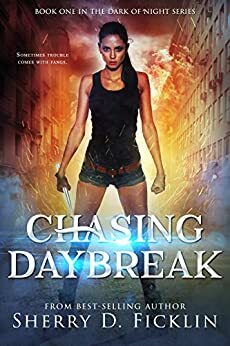 Chasing Daybreak, by Ranae Glass, is the first book in what appears to be FOUR books in a series called The Dark of Night. The story features 22-year old Isabel Stone who is a human protagonist, and private investigator. She gave up being a teacher to take over her fathers business after he suddenly passed away. She's even been called the "midget bounty hunter" because of her petite stature. Isabel, who apparently has no supernatural abilities, takes on normal and supernatural cases to help support her family. Her partner, Shane Brooks, is a vampire and her ex-fiance who lives in Isabel's attic. Shane was actually attacked and turned on the day they were supposed to be married. After Isabel and Shane survive being burned to death by an arsonist, they pick up the case of a missing woman who vanished into thin air leaving a family to wonder what really happened to her. If finding the missing woman wasn't enough, Isabel starts finding bodies piling up on her front porch. Who is leaving them there, and why? Should I talk about Isabel's strange family including her 3 younger sisters and her mother? Should I mention that Glass portrays the family as being ITALIAN even though the name STONE is English in origin? Shall I mention little sister Heather who knows things because she claims she's psychic? Shall we mention that even though the story is filled with vampires, and vampire hating humans, there might be a surprise tertiary character as well? Chasing Daybreak is currently FREE for Kindle & Nook & Kobo. 4.0 out of 5 starsPleasantly surprised! I had received this kindle book for free and rarely do I enjoy a free book. I always wonder what the catch is. Usually the book isn't very good but I have to say I really enjoyed this book! If a book is given as a gift and it's good then it deserves the good review it earned. I read mostly urban fantasy and I like my female lead character to be tough, capable and dependent on herself. Therefore, I really liked Isabel Stone. Isabel took over her father's PI firm after he died and she helps her mother put one of her sisters through college. She has three sisters, an ex fiance that was turned into a vampire on their wedding day and the head of the vampire clan, Xavier, who is interested in Isabel. I was not expecting the family dynamic that began to play out. I thought they would be in the background but was pleasantly surprised when they all had very interesting stories of their own. I like a love interest but I don't want it to take over the story and this one didn't. The only thing I didn't like was it seemed to be too short for me. I really wanted more story as I was immediately pulled in from the very first page. That's how I know I like a book. It begins with the first page and this one had me at the start. I definitely want to know what happens in this new series. I really enjoyed it from beginning to end! Overall, Chasing Daybreak gets 4/5 Platypires.